Resorts and casinos are popular destinations for travelers of all kinds. The enticing thrill of gaming or the relaxation of a resort vacation continues to draw more and more groups each year. Whether you have a group looking to travel to a resort or casino, or whether you work for one and need transportation for your clients and guests, Windstar Lines has you covered. Let us help you take the stress out of planning and coordinating transportation. Our fleet of safe, comfortable, and reliable multi-passenger vehicles are perfect for use as shuttles to and from the airport or for providing guest and/or employee parking lot shuttle transportation. From our 21 Passenger Minibuses to our 56 passenger Luxury Motorcoaches, we can cover just about any ground transportation need you may have. 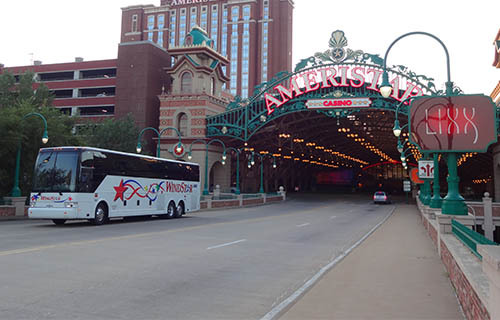 All of our buses have a wide array of amenities to accommodate your needs. Let's talk details. If you have any questions or are ready to get a quote, our professional charter sales agents are ready to assist you!